1st Place: Good guys do finish first! As the photo might suggest, Travis Schroeder and Tom Reed not only succeed on the water, but more importantly, will succeed as parents. They raise their children right by involving them in their lives and teaching them about our great sport. Someday, another Schroeder & Reed team may be winning R & B tournaments. their total profits $954! However, their 11.61 pound limit did not come easily; they had to rely on prior experience. Both members made a practice trip to the lake beforehand but neither had much to show for it. On tournament day they began in an area they had success years before - a good move. It only took 30 minutes to strike. At that time, the biggest fish of the tournament fell victim to a 1/2 ounce Strike King swimjig. The jig was in the bluegill color and matched with a watermelon candy NetBait Paca Chunk trailer. Their area was 30 yards long and 18-20 feet deep located off a flat. The sweet spot had thick weeds in the depths. They tried several other areas but failed to connect, so they kept coming back. Schroeder explains, "We would hit another area and come back. It seemed each pass produced a keeper." They boated five keepers on five separate stops. Their final stop produced several bites, but the wrong kind: "I landed a monster pike at least three foot long, and then we both got bit off a couple of times. The pike obviously moved in and we never got bit by a bass so we left and never came back." The team had a limit, but two fish were barely measuring 14 inches. With only 30 minutes remaining, the decision was made to finish up on Syracuse Lake. It was here Tom pulled out an antique Bomber 500 crankbait (one that still bear's a metal lip) and dragged it through the weeds. With 10 minutes remaining, Tom bagged a 15 inch fish, which may have made the difference. 2nd Place: The 2011 Points Champions are now the 2012 Points Champions. Teddy Bradley and Mark Fennell felt the pressure to perform in the last tournament of the season to solidify the points, and again, they proved their dominance. Their 11.08 pound limit was the only other double digit limit brought to the scales which secured their hold on the Standings by nearly 30 pounds! Their high finish won them $432 for the day, but now an additional $400 will be waiting for them at White Lake for 2012 Points Champions. 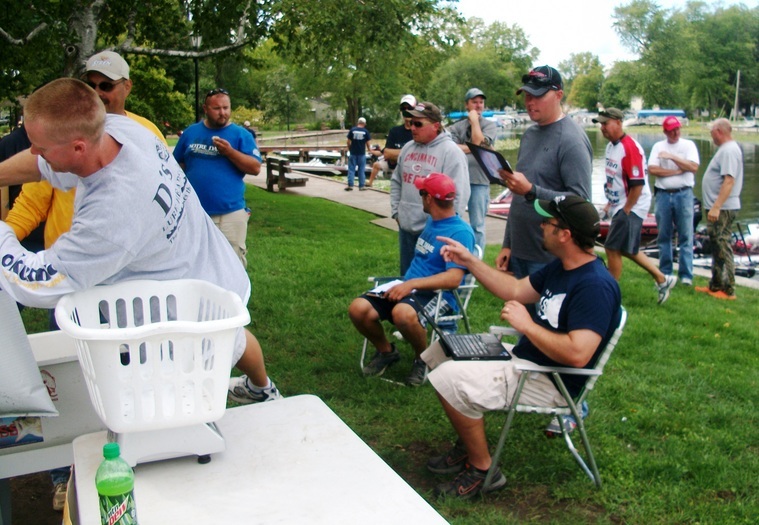 Decision making has been a defining characteristic for the champions the past two years and the Lake Wawasee tournament was no exception. After practicing twice the previous weekend, Bradley admits, "We were probably lucky I practiced Wawasee (Monday) when I did. I could barely boat a fish when I was there, but when I went to Syracuse (Sunday), I had a great day. As it turned out, the fish cooperated for everyone on Sunday, but not Monday. 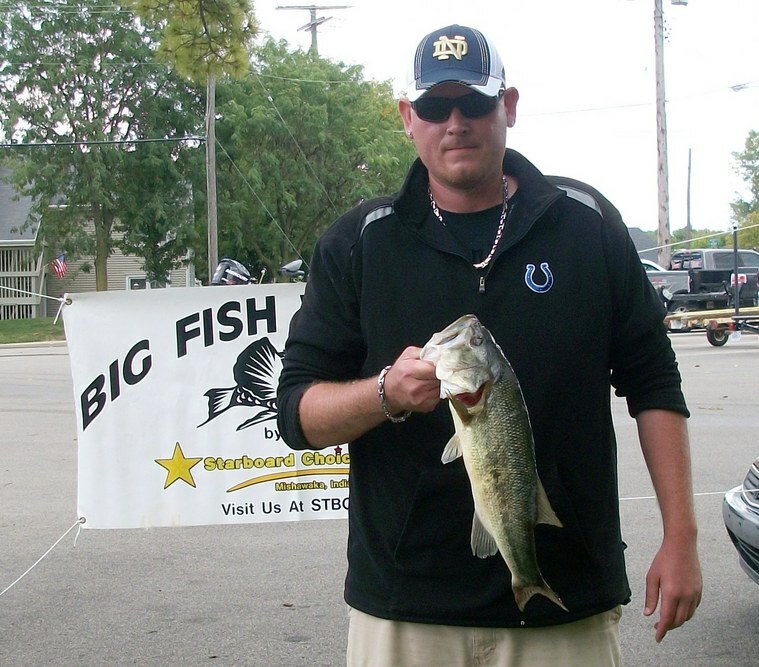 If I had had success on Wawasee, we would have fished there and it appears it was much tougher there today." 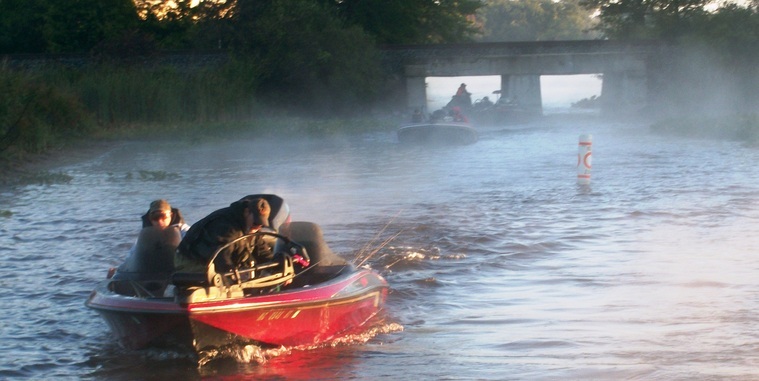 The team spent all of their time on Syracuse, which not only had an easier bite, but gave them extra time to fish. 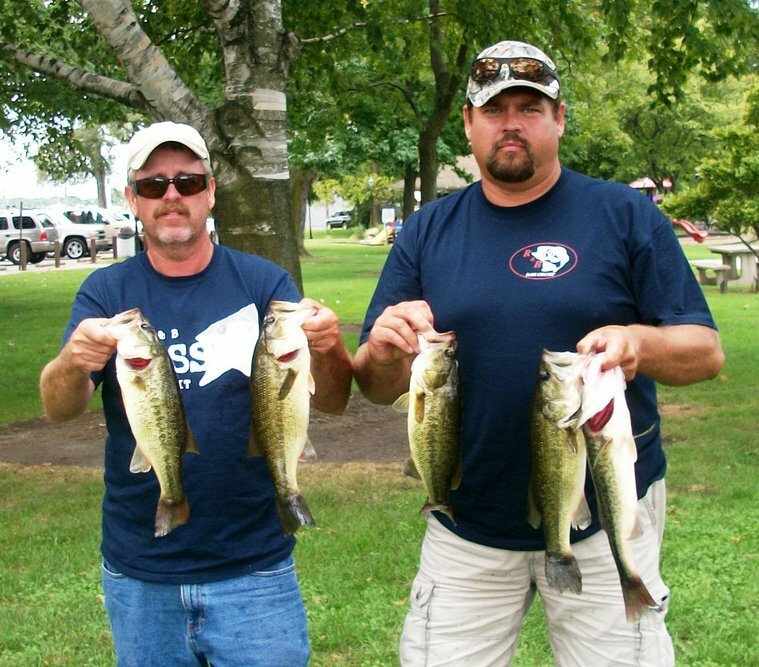 Diversity was the name of the game as they used five separate baits to weigh their five fish. They began the day fishing shallow with a frog and bagged three keepers. They then targeted the weeds on the mainlake flipping chigger craws and jigs, but also retrieved swimbaits and square-billed crankbaits through them. They landed eight keepers total. The key to their primary area was the thickness of weeds. They targeted any open pocket they could see. This also influenced when they fished it. Bradley reveals, "We began somewhere else to allow the sun to rise first, making it easier to see the pockets." 3rd Place: The team of Mark Farver and Steve Kline are becoming regulars in the Top 5. In their first year on the R & B, this is their third time amongst the best. A 9.91 pound limit was void of any big fish, but a 4-pound bass that spit Mark's spinnerbait could have landed them in the winner's circle. "I don't know what happened, but she came up and just spit it," admitted Farver. Regardless, they pocketed $260 for the high finish and claimed second place on the final Standings. Amazingly, the team caught over 20 keeper bass on Syracuse with a combination of spinnerbaits and jigs. They even reported having a pair of doubles. "We had a great practice," admitted Farver. 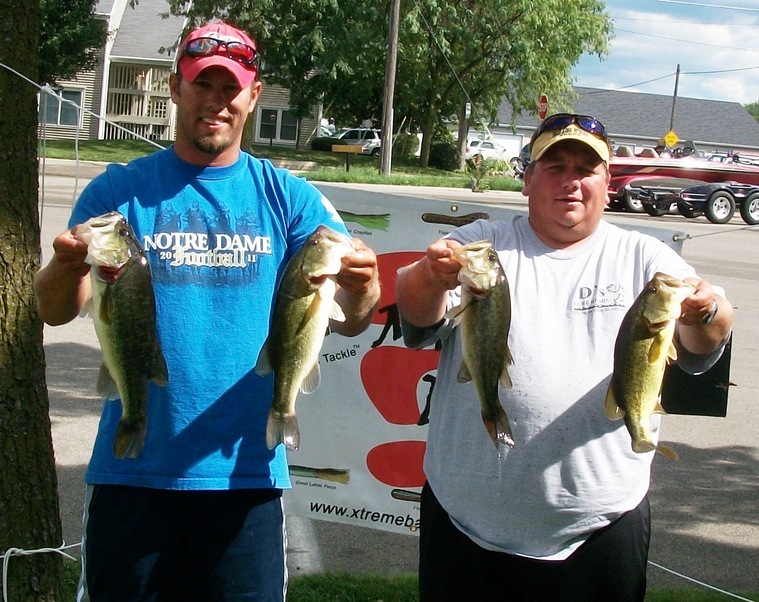 "We caught them pretty good on Syracuse and Wawasee, but the day before Steve came out and struggled on Wawasee. Then we were call boat, so that made the decision to stay on Syracuse pretty easy." Spinnerbaits produced early and then the jig bite warmed up, but the team continued to switch up between the two baits and both produced. They fished alongside Bradley and Fennell for most of the day. 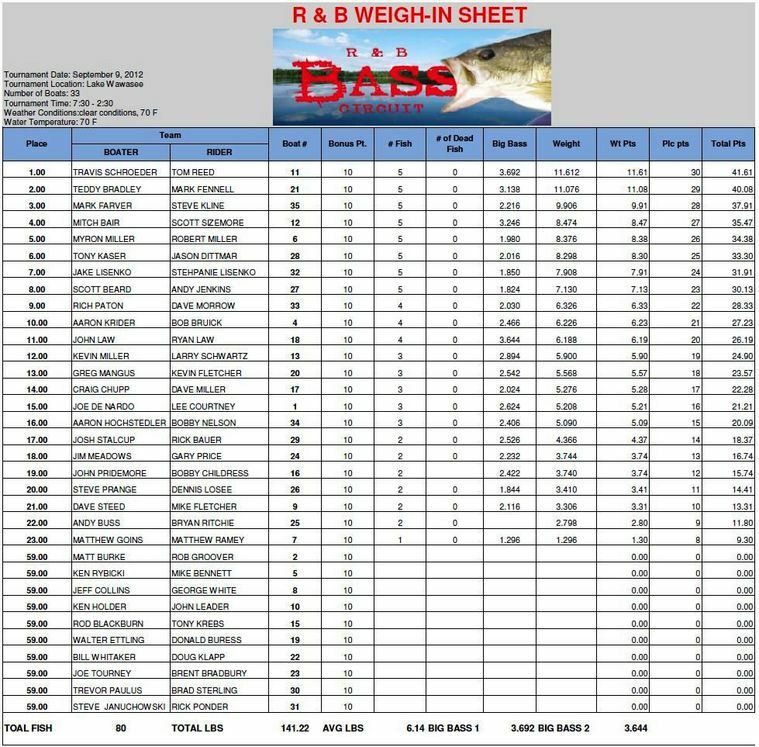 4th Place: Fishing solo, Scott Sizemore apparently did not need his normal partner, Mitch Bair, around to boat 8.47 pounds of largemouth from Lake Wawasee and claim a top 5 finish. Perhaps what was best, was not having to share the $172 he won. However, halfway into the tournament, things were not looking good as his livewells were empty. "We had a great practice the weekend before, and I spent the first half of the day in areas that produced then. When I left, I went to the some boat docks with wind blowing into them," Sizemore reveals. "I skipped a 1/4 ounce, green pumpkin Mikey Stewart custom jig under the pontoons and the very first boat produced my biggest fish (3.25 pound largemouth). The next two boats also produced keepers. In just 30 minutes, I had my limit." Unfortunately, the bite dried up then as he never boated another keeper. 5th Place:Bob and Myron Miller are also new to the R & B and are also becoming regulars in the top 5. They too logged their third top 5 in just six events this season. Their attack was conventional in that they began with topwater baits and were able to pick up three keepers. When this bite died, they focused their attention on the docks. They attacked the docks with senkos, but the bite was particular. Bob Miller explains, "We had to absolutely deadstick the bait. The key was the ultra slow retrieve." 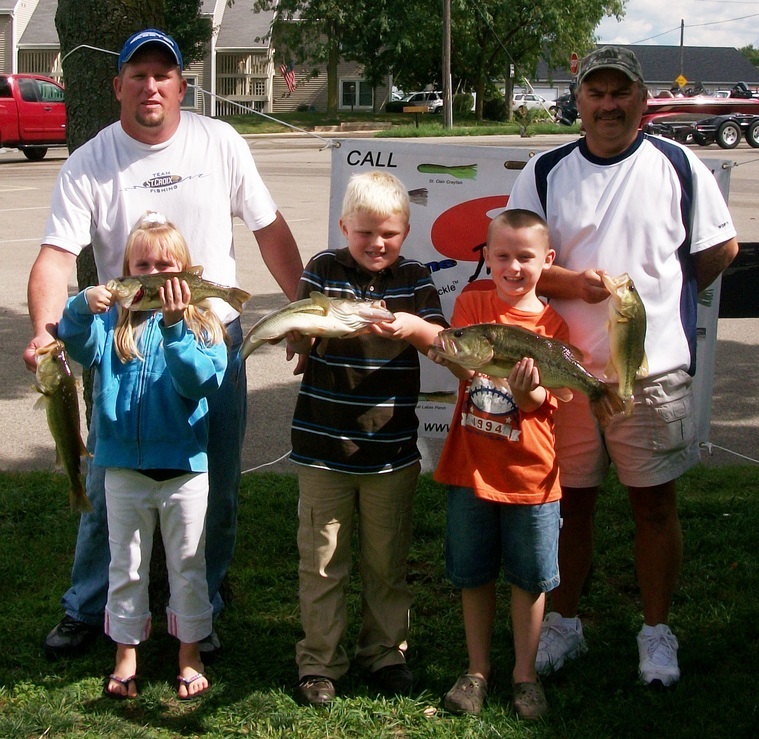 Their best five fish weighed 8.38 pounds and won them $104. 6th Place:Jason Dittmar and substitute partner, Chip Harrison, weighed a 8.30 pound limit and won their entry fee back, $70. D's Lures Award:Jake, and wife, Stephanie Lisenko weighed a 7.91 pound limit to win gear and shirts. Presented by Xtreme Bass Tackle, John Law used XBT tubes throughout the day and consequently won $100 in cash and over $100 in prizes. 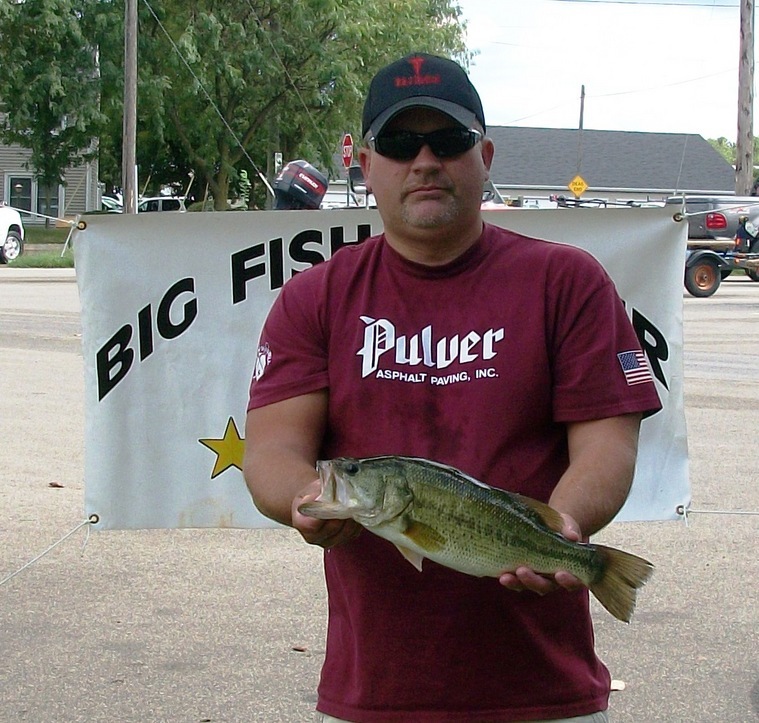 Wayne Carpenter of XBT, not only provided the award, but also supplied free baits for all participants. To make his day better, his son, Ryan, landed the second biggest fish of the tournament to earn $66 and win the Solar Bat Sunglasses Big Bass Award. They will also be awarded a new pair of Solar Bat Sunglasses. 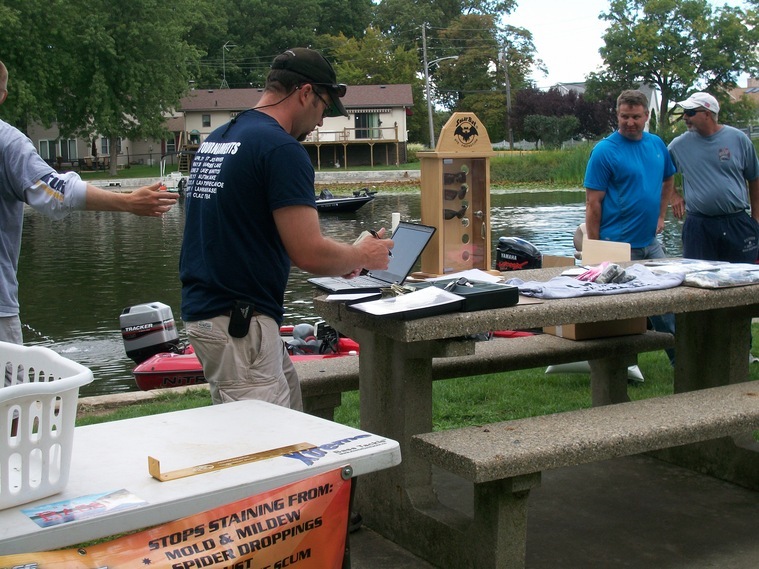 The Lake Wawasee tournament required the help of many. In no particular order the tournament directors thank: Dennis Losee, Steve Prange, Rick Bauer, Josh Stalcup, Travis Schroeder, Tom Reed, Teddy Bradley, Rick Ponder and Steve Januchowski.